Water (Aqua), Glycerin, Propanediol, Myristoyl/Palmitoyl Oxostearamide/Arachamide MEA, Capric/Caprylic Triglyceride, Cetearyl Alcohol, Glyceryl Stearate, Polyglyceryl 10 Distearate, Vitis Vinifera (Grape) Seed Oil (Grape), Sorbitan Stearate, Portulaca Oleracea Extract, Dimethicone, Hydrogenated Vegetable Oil, Olea Europaea (Olive) Fruit Oil (Olive), Tocopheryl Acetate (Vitamin E) (Olive), Simmondsia Chinensis (Jojoba) Seed Oil (Jojoba), Sodium Hyaluronate (Hyaluronic Acid), Phytosterols, Carbomer, Caprylyl Glycol, 1,2 Hexanediol, Arginine (L Arginine Hydrochloride), Stearic Acid, Allantoin (Comfrey Root), Fragrance, Tropolone. 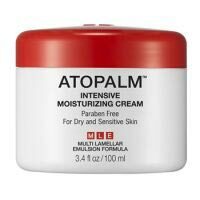 Very moisturizing, great for sensitive skin, works for dry and combination skin and acne treatments. Absorbs quickly in to the skin. Price Try it!